Serra won the Southern Section Division 4 title, ending a four-year run by Oaks Christian, after being runners-up to Oaks Christian in 2017. Two weeks later, Calvin's girls came back to win the State team title, despite not having an individual champion and with only one event victory. That victory came in the first race on the track, the 4x100 relay. 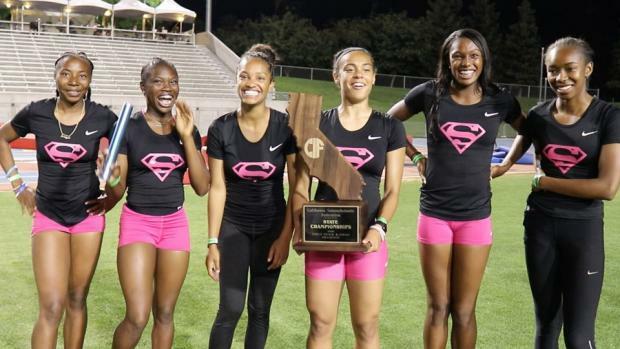 The team of Queen Okoh, Jaylah Herron, Destinee Reid and Jazmyne Frost ran a state-leading and then-US #4 time of 45.74. "We finally ran a perfect race in the 4x1," Calvin said amid the post-meet celebration. "(The) 4x1 set the tone for the rest of the meet." Although the young Conquistador team (five of the six at State return for 2019) didn't win another event, they accumulated points throughout, with Frost getting 2nd in the 100 meters and 3rd in the 200, and Herron, the group's lone senior, getting 5th in the 400. But after El Dorado Hills Oak Ridge senior twins Elena and Maddy Denner went 1-2 in the 3200 after going 4-1 in the 1600, Serra was at a deficit with only the 4x400 relay left to decide the team title. Serra need at least a 3rd place finish from the 4x4 team of Okoh, Maya Rush, Frost and Herron. "There's no pressure, I tell them, when you're prepared," Calvin said. "They were very prepared for this moment. In practice, we get after it every Wednesday, training for that moment. And just to see them execute is beautiful." With Herron running a 53.1 anchor split, she brought Serra home in 3:44.37 for 2nd behind Bonita, securing the school's second State team title and first since 2012. "We were talking about this moment since August," Calvin said post-meet, "focusing on what it takes to get here not necessarily getting here. The girls have been putting in work." Frost, a first team MileSplitCA All-State selection, had a hand in 32 of the team's winning total of 36 points. She was asked in a written exchange to about Coach Calvin's impact on the team's success. "Coach Calvin pushed the team and I to work hard each day," Frost wrote. "My team and I were worried in the beginning of the season because nobody knew about us or we weren't ranked, but Coach Calvin consistently told us to "trust the process" because we will eventually prove everyone wrong. Therefore, with these words, it motivated us and made us more "hungry" for success. "Coach Calvin has always believed in us because he knew our potential from the beginning." Post-CIF Championship interview with Chris Calvin.